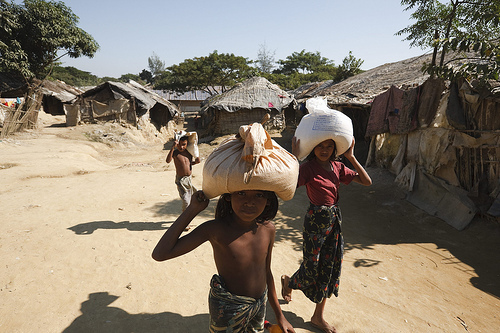 Rohingya children from Burma (Myanmar) carry rice distributed by WFP to their house in Nayapara camp. Photo courtesy of UNHCR/S.Kritsanavarin. The Sentinel Project is expanding the scope of its monitoring work to include situations of concern (SOCs) in four new countries. These countries were selected by balancing their apparent risk levels with our own resources and ability to have a positive impact. The next step will be for teams assigned to each country to conduct a comprehensive risk assessment, the results of which will be released over the next few months. The following is a brief summary of each of the new SOCs. For more detailed background information, you can visit the page devoted to each SOC. Please check back with us frequently for updates and other details. Nagorno-Karabakh is the subject of an unresolved dispute between Azerbaijan, in which it lies, and its ethnic Armenian majority, whose bid for independence is backed by the neighbouring Republic of Armenia. Conflict erupted following the collapse of the Soviet Union and at least 30,000 people were killed by the time a truce was declared in 1994. Since then, a simmering stalemate has prevailed and both sides have reported sporadic breaches of the truce. Azerbaijan has said it may use force to try to regain control of the region. There have been long-standing tensions between Rakhine people, who are Buddhist and make up the majority of the state’s population, and Muslims. Most of these Muslims identify themselves ethnically as Rohingya, a group that originated in part of Bengal, now called Bangladesh. In June of this year, dozens of people were killed in clashes sparked by reports of a Buddhist Rakhine woman allegedly being raped and murdered by three Rohingya Muslim men. The ensuing violence forced around 80,000 Rohingya to flee their homes and into a tenuous situation since neighbouring Bangladesh is refusing their entry. Many indigenous tribes face the imminent risk of extinction because of armed conflict and forced displacement. In particular, a distressing situation involves the Páez people, also known as the Nasa, who have been caught up in the ongoing armed conflict between the Colombian army, the Revolutionary Armed Forces (FARC), and right-wing paramilitaries. On August 13th, Lisandro Tenorio, a prominent Nasa spiritual and community leader was shot dead by unidentified gunmen believed to be from the FARC. Territory: Indigenous tribes hold title to substantial portions of Colombia, primarily in the form of reserves (Spanish: resguardos). Papua New Guinea is home to hundreds of indigenous tribes including some which have been contacted by the outside world only very recently. Since Indonesia took control of West Papua in 1963, there have been killings, rapes and other human rights abuses by the military. According to Amnesty International at least 100,000 indigenous lives have been lost as a direct result of the conflict. The Indian Ocean tsunami caused huge death and destruction when it smashed into northern Indonesia in December 2004, but it also helped to galvanise a peace process to end one of Asia’s longest-running wars. The Acehnese, who have been fighting for three decades for independence in the province of Aceh, signed a peace deal with the government eight months after the disaster. Both sides were accused of human rights abuses, and many of the conflict’s victims were unarmed civilians. Recently, there has been several violent incidents which has many analysts questioning whether the peace agreement is now unraveling.